Typically a "disease" that is most commonly associated with Tangs and Surgeonfishes, but one that can be contracted by other species as well, what is referred to as black spot disease, tang disease or black ich is actually caused by an infestation of tiny genus Paravortex member turbellarian flatworms. Black spot disease are parasitic organisms that are much less dangerous and life-threatening, as well as rather easy to get rid of compared to other ich diseases such as Oodinium, Cryptocaryon and Brooklynella. Nonetheless, it is a problem that needs to be treated upon recognition to eradicate infected fishes of these parasites. After "hatching out," the juvenile turbellaria worms can swim freely and exit the substrate seeking out a host fish. Once they find a suitable host fish, the juvenile turbellaria attaches to the fish's skin or gills and begin feeding on the fish's blood, growing from a size around 77 to 450 μm in about 6 days. After feeding for about six days, the turbellaria falls off the fish and descends into the substrate. About five days later, the worm's body ruptures and releases a new population of about 160 young worms which can immediately swim about and attach to a new host. The cycle starts again but in larger numbers. Once these worms start feeding on a host fish they acquire pigmentation, which causes the appearance of black spots about the size of a grain of salt on the body and fin membranes. The worms have the ability to freely move about on fish as the spots do not always remain stationary. On light colored fish they are easy to see, whereas on dark colored ones they may go unnoticed at first. As with other surface parasites, the infected fish will scratch up against objects or the substrate in an attempt to dislodge the parasites, and if the infestation is allowed to progress the fish become lethargic, lose their appetite and colors, rapid respiration develops and secondary bacterial infections can invade damaged tissue sites. If surface infections develop, treat as with any other bacterial infection. Give all infected fish a freshwater dip, followed by a formalin bath and continue treatment in a quarantine tank. Methylene Blue has been used with some success in quarantine tanks but not in the main tank as it will damage the biological filter. Reinfection will occur no matter how effectively the fish have been treated if these parasitic turbellarian worms are not eradicated from the main aquarium. Unfortunately, because they can survive for several months without a host, this is often not an easy thing to do, but here are some suggestions. 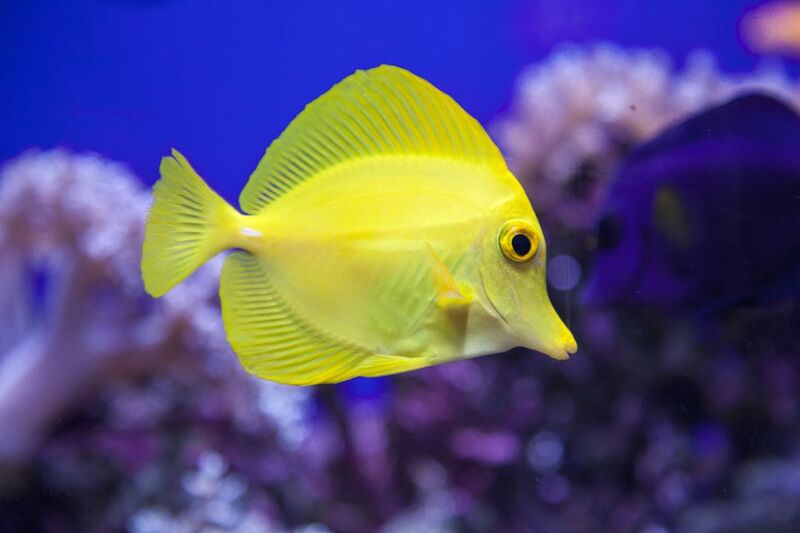 Leaving the main aquarium devoid of all fish for several months is a cure that some aquarists recommend, however, this is not always possible or desirable. The theory here is that, without a host fish, the life cycle chain will be broken and the turbellaria will not be able to reproduce and you will just be waiting for the turbellaria to die of old age. Young worms live in the substrate and feed on detritus and organic debris until such time they mature and go in search of a fish host. By siphoning up the excess organic matter that can build up on the bottom of the aquarium can help to control their numbers. For fish-only tanks that have no freshwater sensitive invertebrates present, hyposalinity can be applied. When using hyposalinity (osmotic shock), stirring the substrate occasionally will help to release the higher salinity water trapped in the substrate, exposing the flatworms to the lower salinity water in the tank. Turbellaria worms are after all, marine flatworms. There are some fish which will consume them when given the opportunity. These fish include six-line wrasses (Pseudocheilinus hexataenia), yellow wrasses (Halichoeres chrysus), Striped Mandarinfish (Synchiropus splendidus), Spotted Mandarinfish (Synchiropus picturatus) and no doubt, any other Dragonette.